Republished with the kind permission of The Sheehab, who are undoubtably & indisputably Robert Sheehan's best and biggest fans! Last March Philip Reeve very kindly talked to us about his Mortal Engines books and his hopes for the film. We asked him at the time if he would talk to us again after he saw the film with whatever non-spoilery thoughts he could share. Thanks to Philip for sparing the time so soon after the premiere to answer our questions again. How was the premiere and how did you feel seeing your book transferred to film? PR: It was very fancy and on a huge screen - the IMAX screen at Cineworld, Leicester Square, so it was quite overwhelming. Everyone looked extremely smart at the premiere, did you enjoy the evening? PR: I was a bit nervous tbh, it’s not really my type of thing. Hear you saw Mortal Engines twice. Do you think everyone should see it more than once? 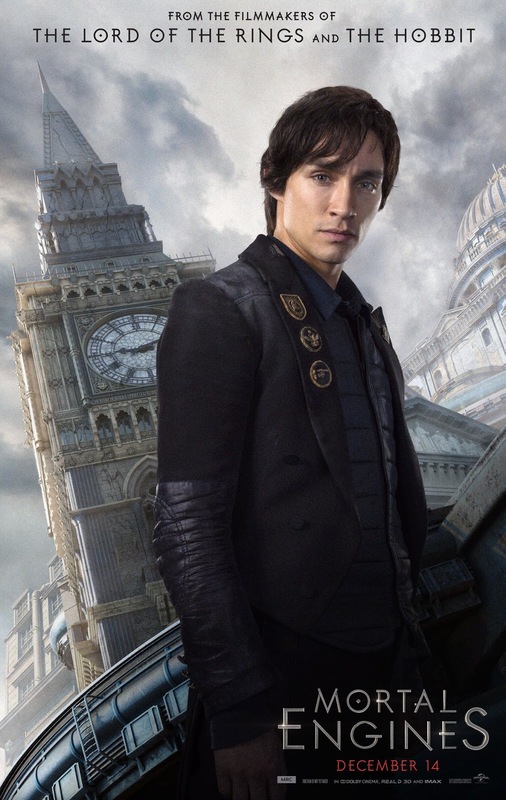 PR: The first time was at the Premiere - it was on a massive screen & very spectacular,but I was slightly distracted by tracking the changes they’d made to the story world - it’s like an alternate universe Mortal Engines. I enjoyed it though! On my second viewing I was able to ignore that and focus more on the details and the nuances, so think I liked it more. I spotted my cameo too, my son and I share the screen with Robbie (for about 0.5 seconds! ).It was on a smaller screen, but it had Dolby Atmos sound which made me aware of how good the music and sound design is. Of course, everyone should see it as many times as possible. You particularly mentioned Robert & Hera, Jihae and Stephen Lang as stand-outs in the film.They all seemed genuinely thrilled with the film and the story.That must be gratifying? Rob said in an interview that he thought he now knew who Tom Natsworthy was based on. Do you see much of yourself in Tom? PR: Did he? I don’t know- Tom is just meant to be an ordinary person who’s caught up in the middle of this wild adventure with all these strange, extreme characters.I suppose I was imagining how I’d react in those situations,so there must be a bit of me in him.But there’s a bit of me in the others too, especially Hester. Obviously we are all hoping for sequels to the film. If you had to summarise the film in a few words to encourage people to see it, what would you say? PR: It’s a huge and exciting new world, lots of exciting action, but it has a heart, it’s surprisingly moving. Christian Rivers and his team have done an amazing job. If you had to sum up your response to the film in one word what would it be? Apart from the fact that Tom and Hester have been ‘aged up’ do you think Rob and Hera are good representatives of your Tom and Hester? Did you talk to them about their characters when you first met them on set? PR: They’d already been shooting for about a month when I visited, so I think they knew their characters pretty well. The ‘ageing up’ doesn’t bother me at all- it’s their status that defines them, not their age, and that hasn’t changed. Tom’s still a lowly apprentice, Hester’s an outcast. They’re not the characters from the book and I wouldn’t expect them to be, but there are plenty of similarities. Robbie is much more attractive than book-Tom, both in looks and personality, but he still managed to capture Tom’s awkwardness, and he’s very funny at times-little physical moments, a sort of earnestness. There’s a bit where he puts himself between Hester and another character and says ‘I’ll handle this’ which is just perfect- because we know that a) he can’t handle it and b) Hester’s perfectly capable of looking after herself. He’s very loveable. Two more things, when did you first fall in love with writing and would you be up for a cameo again in a sequel? PR: I guess I was 6 or 7 when I first fell in love with writing. And yes, I’d do another cameo- I’m holding out for a full second next time! Thanks to Philip Reeve for taking the time to talk to us again. Please go and see the film as many times as you like and remember he has several other books in the Mortal Engines series available to buy. Philip Reeve also wrote up his own thoughts on the movie of his book!